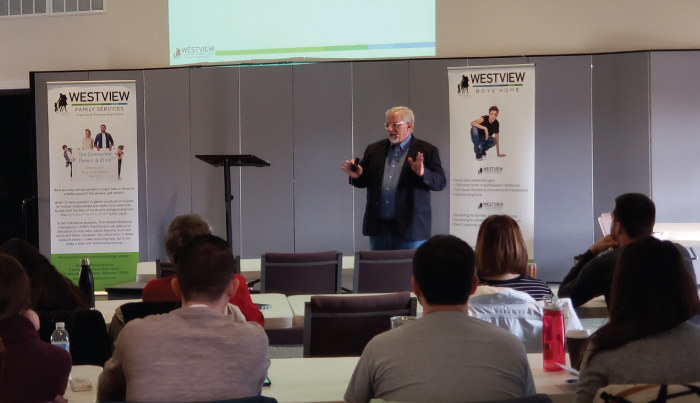 Saturday, January 19, the Lakehoma Church of Christ hosted Westview Family Services for a presentation of its “Connected Parent and Child” seminar. Despite the cold, blustery weather, about 40 people showed up to study the critical connection between parent and child. Parents, soon-to-be parents, grandparents, educators, and church leaders were present. Each was able to gain insight into their relationships that might empower their personal connections with children to be more healthy and helpful. WFS team members Chase Thompson, Ron Bruner, Terry Owens, and Josh Birney led the four segments of the programming. Thompson covered the risk factors that make connections more challenging for children. Bruner discussed attachment styles and the personal histories that tend to shape how we attach. The Trust-Based Relational Intervention® segments were covered by Owens (Connecting and Empowering Principles) and Birney (Correcting Principles). Several participants indicated their interest in upcoming sessions at WFS that will study TBRI® in more detail.